At our recently concluded 52nd Annual Convention in Atlantic Beach, NC, delegates took action on a range of issues, including the election of officers and executive board members, approving resolutions to guide our work for the next year, and writing letters to the Congress in support of the Employee Free Choice Act and comprehensive health care reform. Delegates re-elected James Andrews, President, and MaryBe McMillan, Secretary-Treasurer, without opposition, to new four-year terms. Delegates also elected a new Executive Board. You can view a list of all our board members here. Delegates approved resolutions, twelve in all (PDF), covering a range of issues important to workers and working families including public employee collective bargaining, justice for farmworkers, revitalizing American manufacturing, passing pro-worker state and federal legislation, and defending the postal service, among others. McMillan gave an update on the Employee Free Choice Act, which currently is stalled in the U.S. Senate, and delegates responded with 279 letters to Senator Hagan and their member of Congress in support of EFCA. Jonathan Bray, AFSCME, led a discussion on why health insurance reform matters for union members – not least because failure on reform could cripple the rest of the president’s agenda, including the Employee Free Choice Act. Delegates wrote 200 letters to Hagan and their Representatives in support of comprehensive reform with a public health insurance option and ordered over 7,000 health care flyers to distribute to their membership. Delegates also responded to a direct appeal from Jason McNeill, president of USW Local 1161L in Asheboro, for letters to President Obama urging him to use his power under international trade rules to protect union jobs threatened by China’s illegal dumping of cheap tires in the American market – action Obama took later the same day. Conventions are also an opportunity for member education and training. On the first day, David Clegg and Roger Shackleford led a great panel – Aid for Dislocated Workers – where they discussed what state agencies are doing to help unemployed workers cope with the economic downturn. On the second day, Caroline Farmer of the NC Dept. of Justice, Chris Kukla of the Center for Responsible Lending, and Al Ripley of the NC Justice Center led another great panel on Consumer Protection, sharing with delegates advice on how to spot scams, prevent identity theft, and avoid predatory lending practices in consumer loans and mortgages. to the convention agenda was the screening of a documentary film. The movie, Where Do You Stand?, chronicles the 25-year struggle to win a union at Cannon Mills in Kannapolis, NC. It’s an inspiring – if sobering – story of struggle for justice in America’s textile industry, told mostly by the workers themselves. Delegate reaction to the film was overwhelmingly positive. One told us the film, “makes me appreciate being a union member and how hard it is for some to have a union.” Another delegate said, “This movie shows just how far greedy corporations will go to keep the unions out and to create a divide in the workers.” Interested readers can purchase a DVD of Where Do You Stand? from California Newsreel. While we planned fewer speeches from elected officials, there were some great ones, including State Rep. William Wainwright (D-12). Wainwright opened our meeting with an inspiring plea for the passage of state legislation to improve the lives of working families. On the final day of the convention, U.S. Senator Kay Hagan made a surprise appearance. Speaking on the 8th anniversary of 9/11, Hagan took time to honor the first responders at ground zero, 40% of whom had no health care insurance when surveyed in 2008. Hagan said comprehensive health care reform is critical to ensuring economic recovery and stability. Hagan also acknowledged the importance of the Employee Free Choice Act and reiterated her support for labor law reform that levels the playing field for workers. According to the evaluations submitted by delegates, the convention this year was our most successful, productive, well run and enjoyable meeting to-date. 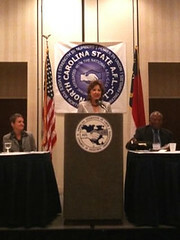 Thanks to our member unions for their continued support of North Carolina’s Union Movement.